With its orange, black and white stripes, the clownfish is certainly eye-catching. Thanks to being so easy to recognise, it has long-since been a star in the world of marine fishkeeping. But it is not just its appearance that makes it such an exciting water dweller; it also has a couple of astonishing tricks up its sleeve. 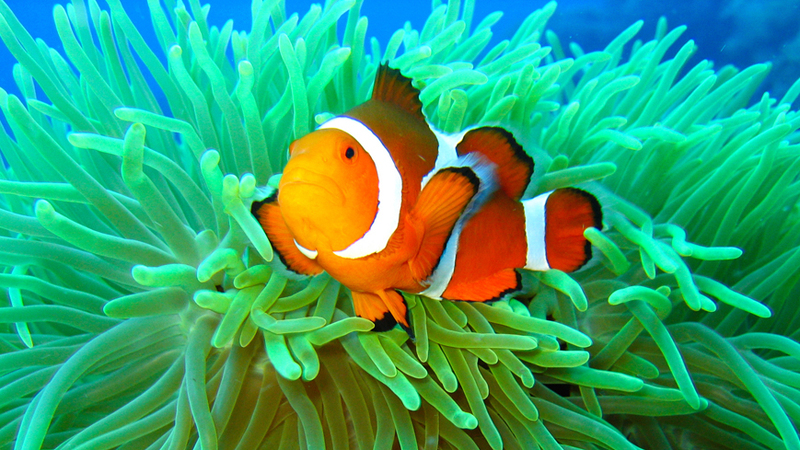 Clownfish are anemone fish and have their natural habitat in coral reefs in tropical Indo-Pacific waters. The two best-known species are the orange clownfish (Amphiprion percula) and the false percula clownfish (Amphiprion ocellaris). The latter shot to particular fame thanks to the film ‘Finding Nemo’. Like all other clownfish, false percula clownfish tend to stay very close to home: they spend most of their time on, in or being protected by very special kinds of sea anemones, which are not generally known for being particularly friendly. The anemones tentacles are covered in poisonous stinging cells, which they use to stun fish and other small creatures before killing them. However, clownfish are unaffected by this poison; the anemones ‘recognise’ their tenants and do not deploy their stinging cells on them. This enables the clownfish to move freely between the tentacles, where they are protected against hungry predators. The clownfish thank the anemones for their hospitality with a few caretaking services. They keep the tentacles clean and chase away creatures such as butterfly fish, which would otherwise kill the anemones. Biologists refer to the harmonious and mutually beneficial co-existence of these two very different species as a symbiosis. This shared habitat is one that lasts for life – some clownfish have been known to remain in their sea anemone for up to 35 years in the wild and up to 20 years in captivity. The fact that they do not grow to more than nine to eleven centimetres probably helps in this. Clownfish do not usually live in sea anemones as solitary creatures; instead, they tend to be part of a group. This is usually made up of one female and several males. Clownfish have a highly sophisticated system for maintaining the right gender balance. All clownfish are born male and grow up male – but only the second largest clownfish can procreate. The strongest and largest clownfish, on the other hand, is always a female. Only when she dies does the largest male change its gender and become the female. In doing this, its gender organs also change so that it can now lay eggs – with the help of the male that moves up from the ranks of infertile males and reaches sexual maturity. The sedentary lifestyle and simple brooding behaviour of clownfish make them one of the few marine fish that are easy to breed. This means that instead of having to use clownfish caught in the wild, anyone who wants to add these colourful fish to their own marine aquarium should obtain them from breeders. Such clownfish also tend to be far healthier and stronger than ones caught in the wild.